We are going to have a ceramah tonight at Restaurant Busy Corner, 83, Jalan SS22/11, Damansara Jaya, Petaling Jaya. All PJ DAP Candidates are speakers for the ceramah. All are invited, please bring your friends and family members to attend, especially fence-sitters and those who are apolitical. 7:00 am Taman Aman walkabout. 3:00 pm Walkabout Sea Park / Paramount houses. 7:00 pm Speaking at DAP Sekinchan dinner. 8:00 pm Ceramah at Damansara Jaya Busy Corner. First of all, I would like to apology to readers of my blog for not being able to update this blog on a daily basis, which was my original target during election campaign. For those who wish to know the latest situation in PJU, you can be assured that the PJ Rocket Team will and is already putting up a good fight this time against the might of the BN. For the first time in PJ DAP election campaign, our banners, streamers and buntings are first put up ahead of BN candidates. Perhaps this is a good head start for us. Walkabouts have been intensified during election campaign especially after nomination as we made rounds and rounds of visit to various hotspots i.e morning markets, line-dancing spots, tai-chi spots etc to meet and greet the residents. I have spoken in various interviews with reporters that this is what had been done by the DAP Rocket Team in PJ for the past one year and what we are doing now are merely the intensified version of our previous works. We are used to it already. On another hand, I am touched by the huge and warm supports coming from members of the public. Traders give discount and sometimes even donated generously in cash and kinds to the PJ Rocket Team. To date, we have received no less than 100 boxes of mineral waters, three water dispensers etc. What is most important and touching is that my operation centre is basically manned by new members or volunteers. This is probably the first time I meet them but I am very touched by their commitment towards a better Malaysia. Without them, I will never be able to focus on my campaign and walkabouts. I will try to update this blog with more information of my activity in my area – N35 Kampung Tunku. My opponent is Sheah Kok Fah. My constituency is N.35 Kampung Tunku. The state constituency is a majority Chinese majority seat. During the last General Elections, there was 67.7% Chinese in Kampung Tunku, 11.2% Indians and another 19.1% Malays in Kampung Tunku. This time, the Malay voters has increased 1.6% while the Chinese and Indians voters percentage drop by 0.5% and 1.2% respectively. KUALA LUMPUR: When it comes to attracting voters, does bigger always mean better? The previous general election saw an array of posters, banners and buntings, in various sizes, promoting the various political parties. Running high on election fever, Maju Holdings Sdn Bhd recently came up with a huge banner, covering half of its building, in a show of support for Barisan National. The banner which carries the words Maju Bersama Barisan National (Progress with BN) will be up throughout the election campaign period. A company spokesperson said the banner which covered 23 floors of the building was put up on Valentine's day. Meanwhile, Kelana Jaya MP Loh Seng Kok, whose picture is on a billboard overlooking the LDP highway here, said the picture was originally meant for the Chinese New Year celebrations. "The poster wasn't intended for the campaign. It was for my Chinese New Year greeting and was planned as a series of inspirational messages for my constituents. "I might use the space later for the election campaign," he said. DAP Selangor secretary Lau Weng San said the party had adopted a moderate approach in its campaign strategy. "We just use buntings, banners and flags. We tend to focus more on the personal touch and the candidates. "Malaysian voters, especially in urban areas, are aware of issues in the country. "Big posters or billboards are not going to impact the voting. It's the track record of the candidates that matters," he said. PAS information chief Mahfuz Omar said it all depended on the how much the candidates could afford to fork out on their campaigns. "Advertising on billboards is expensive, plus some advertising companies won't want to rent the space for us," he said. Tough fight: Sheah (left) will be taking on Lau for the Kampung Tunku state seat. LAWYER Sheah Kok Fah is the new flag-bearer for the MCA in the contest for the Kampung Tunku state seat in Selangor. Sheah, 43, a former councillor with the then Petaling Jaya Municipal Council (MPPJ), was named as the candidate on Thursday. Sheah said he was joining the political fray with equal measures of excitement and trepidation, as the battle was a tough one. He said that while upgrading the existing infrastructures in the constituency was on his priority list, his main concern was to improve security in the area. “The previous assemblyman must be credited for doing a good job, and I will continue with upgrading work in the area, particularly in the older housing estates like Taman Paramount and Taman Len Seng,” Sheah said. “However, security is the main concern in my election manifesto. I believe public security and safety can be improved through more patrolling by the residents and police, and through using facilities such as CCTVs,” he said. Sheah has also pledged to look after the welfare of the schools within the constituency. Sheah said he would set out to build closer ties with the residents assocations, Rukun Tetangga units and other NGOs to better serve the needs of the people. Slated to meet Sheah in a straight fight is 30-year-old DAP candidate Lau Weng San. Lau, the political secretary of DAP secretary-general Lim Guan Eng, is also making his electoral debut. Besides seeking to improve public security and safety, Lau said his major task was to provide a vigilant check-and-balance to the local authority to ensure better and transparent town planning and maintenance. “This is to avoid non-beneficial projects and waste of public funds,” he said. First-timers: Gu (left) and Cheah are expected to battle it out in Damansara Utama. Besides Lau, the DAP will also be fielding newcomer Dr Cheah Wing Yin, possibly for the Damansara Utama state seat. Cheah, 53, was a political activist in the DAP during the last two general elections, but formally joined the party only last year. Cheah, a private consultant physician, said his aim was to create greater interaction among residents to lessen their sense of alienation and apathy towards the political arena. “It seems that the people have grown more disenchanted and apathetic towards what happens in the local government,” he said. “What I am concerned about is that the local residents are increasingly feeling that they don’t have a part to play in the society and its political processes,” Cheah said. If Cheah contests in Damansara Utama, he will face Victor Gu of the MCA, also a first-time candidate. 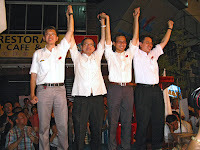 From left: DAP candidates for the Kampung Tunku state seat Lau Weng San, Damansara Utama state seat Cheah Wing Yin and PJ Utara parliamentary seat Tony Pua Kim Wee with BN candidates for the PJ Utara parliamentary seat Chew Mei Fun, Damansara Utama State seat Sheah Kok Fah and Kampung Tunku state seat Victory Gu Chian Peow outside the nomination centre in SS2, Petaling Jaya. PETALING JAYA: DAP has unveiled a manifesto for Petaling Jaya covering contemporary urban issues. The single page manifesto with the tagline "PJ to lead Malaysia forward" outlined their promise to lower crime rates, provide quality education, clean local government and decrease the cost of goods. "For this year, core issues that would swing voters are inflation and crime," said the party's Damansara chairman, Tony Pua, who is also the economic adviser to party secretary-general Lim Guan Eng. In the Petaling Jaya Utara constituency that has about 76,000 registered voters, 76.4 per cent of them are Chinese while 15.2 per cent are Malays with the rest being Indians with an even spread in the age breakdown. "There are a lot of wealthy and socially aware voters in PJ, so we want to make this constituency the affluent and intellectual centre of the country," said Pua, 35. Pua is tipped to contest the Petaling Jaya Utara parliamentary seat against incumbent MP Datin Paduka Chew Mei Fun who is also the Wanita MCA deputy chairman and Women, Family and Community Development Ministry Parliamentary Secretary. An IT expert who made his millions in a public listed company in Singapore, Pua joined the party last year in DAP's strategy of fielding young professionals. KUALA LUMPUR: DAP yang menggelar diri mereka `parti orang miskin’ meminta sumbangan derma orang ramai bagi membantunya merealisasikan sasaran mengurangkan majoriti dua pertiga Barisan Nasional (BN) pada pilihan raya umum ini. Penasihat parti itu, Lim Kit Siang dalam laman blognya membuat kenyataan menggesa penyokong dan mereka yang bersimpati dengan perjuangan parti untuk menyumbang kepada Tabung Pilihan Raya DAP. “Masanya sudah tiba untuk anda mengotakan janji kerana kita memasuki perjuangan dengan sumber yang terhad. Kami perlukan sumbangan kewangan anda untuk membantu membentuk gelombang perubahan,” katanya. Tabung itu yang diwujudkan khusus untuk membiayai perbelanjaan kempen parti itu membuka ruang kepada orang ramai menyumbang secara online menerusi kad kredit Maybank, Public Bank atau menghantar sumbangan secara terus ke ibu pejabat parti di Petaling Jaya. Bagaimanapun, Tabung Pilihan Raya DAP adalah berbeza daripada kempen sumbangan setiap calon. I just came back from a Hindu temple in Jalan SS1/25. The devotees complained to the DAP that BN has been neglecting them in granting a piece of land to construct an all new temple. The temple commitee had offered to demolish to relocate the 30-year-old temple which was built on a piece of private land in end 2006. Apparently, they temple has to squat from one place to another around the same area and the devotees are afraid that eventually when the project finished, there will be no land for them to build back the temple. Wong Sai Hou answered to the press that the matter has been taken over by MIC. Apparently all issues and problems concerning Hindu temples in Selangor is solely handledby MIC. I doubt very much MIC can deliever something. The committee wish to have a piece of land nearby for their temple. What is it so difficult so find a small piece of religious land for them? The committee even offered to construct an all new structure to house their God but approval was denied. Pak Lah shouted it loud "don't challenge me"
Do your part! Ensure a clean and fair 2008 elections - VOLUNTEER AS A POLLING AGENT and/or COUNTING AGENT! A polling agent is someone who sits in a polling stream (the classroom where the voting takes place) and observes the voting process. Each school may have a different number of polling streams (saluran mengundi) depending on the number of voters in that area. Each polling stream caters to a specific age group. A counting agent is someone who observes the counting of the votes after polling closes at 5pm. You don't have to be a member of a political party to become a PA or a CA. You have to be Malaysian and above 21 to register as a PA or a CA. This is done through the political parties. A PA is armed with a copy of the electoral roll for that particular classroom, pencil/pen and a ruler. The PA basically observes the voter as he/she enters the room. The election officer will read out the voter's name, IC number and his/her number on the electoral roll. The PA will cross out the voter's name on the electoral roll to ensure that we know exactly how many people voted in that classroom. A PA must be alert and take note if there are any irregularities, eg. the voter is female but the IC number denotes the voter is male, the voter is much much older or younger than the IC indicates, the voter is Indian but has a Chinese name, etc. The PA has a right to object and raise questions. More details will be provided at the training. Its a 1 1/2 - 2 hour session depending on Q&A. Training is free of charge. Please forward this to all Malaysians. For more information, call the hotline 016 220 8867 (DAP Damansara). To ease our arrangements, e-mail your name, phone number and IC to pollingagent@gmail.com . Walk in participants will also be welcomed. YAB Dato’ Seri telah membubarkan Parlimen semalam dan ini merupakan satu kejutan dan penghampaan yang besar terhadap masyarakat Tionghua di negara ini apabila Masyarakat Tionghua masih merayakan Tahun Baru Cina. Oleh kerana 13hb Februari 2008 merupakan hari yang ke-7 untuk perayaan Tahun Baru Cina, pembubaran yang dilakukan oleh YAB merupakan sesuatu yang tidak menghormati dan tidak sensitif terhadap perayaan Tahun Baru Cina yang disambut selama 15 hari sehingga Chap Goh Meh. Lebih-lebih lagi, masyarakat Tionghua keturunan Hokkien akan menyambut perayaan Tian Gong pada malam hari yang ke-8 perayaan Tahun Baru Cina, iaitu pada malam ini juga. Kami mendapati bahawa UMNO juga pernah mengadakan perhimpunan agungnya pada tahun lalu semasa masyarakat India merayakan Hari Deepavali. Peristiwa ini juga merupakan satu perkara yang tidak menghormati sensitiviti kepelbagaian kaum dan budaya di Malaysia. Dalam kes ini, Dato’ Seri telah menyatakan sehari sebelum Parlimen di bubarkan bahawa Parlimen tidak akan dibubarkan pada 13hb Februari. Biarpun begitu, Dato’ Seri sendiri telah membelakangi kenyataan ini dan membubarkan Parlimen pada hari kelmarin. Tindakan ini akan mengikis keyakinan orang ramai dan pelabur asing terhadap integriti pentadbiran kerajaan yang selama ini dilaung-laungkan oleh pentadbiran Dato’ Seri. Adalah menjadi pendapat kami bahawa Dato’ Seri harus memberi satu penjelasan terbuka terhadap keputusan membubarkan Parlimen semasa perayaan Tahun Baru Cina demi memulangkan keyakinan orang ramai terhadap pentadbiran kerajaan. Why can't Pak Lah wait for another 7 days? DAP Selangor today went to the PM Office to submit our protest note to the PM for dissolving the Parliament during Chinese New Year festives. The dissolution has seriously spoilt the Chinese New Year celebration mode among the Chinese community in Malaysia and as a result of this, several Chinese New Year open houses have to be either cancelled or down-scaled, including the one organised by DAP National HQ. However, the person who received our protest note, Datuk Haji Ahmad Yaakup did not think so. He claimed that it is the opposite and according to the Federal Constitution, there is no provision for the PM of not to dissolve the parliament in any days. He even further claimed that the polling day is after the Chap Goh Meh celebration which itself does not affect Chinese New Year celebration. It is not about the question of legality but the question of respect dan sensitiveness towards the culture of other races. In addition to that, I pointed to him that the PM had said on 12th Feb that there is no dissolution on 13th Feb but he announced for the parliament to be dissolved the very next day. All these are word of his mouth and he has to explain in his capacity as Prime Minister of why he can change his mind so fast, jeorpadising his personal integrity and credibility. How are we going to attract foreign investment if our policy can be changed overnight? Guan Eng has his comments on this. Why no 2/3 for BN in Parliament. 1. Barisan only briefly lost 2/3 majority once, in 1969. 2. Since 1957, it has amended the constitution 690 times to propagate its power. By comparison, USA which is more that 200 years of has only amended its constitution 27 times; Singapore as little as only 4 times. Barisan's ability to amend the constitution as it likes (and make unjust and unfair constitutional changes) must be stopped now. Why? Because of gerrymandering, or unfair election rules. The election rules are stacked against the opposition. No matter what happens, the opposition will never be able to win the next election. 3. Here is the decision making power process within our present Cabinet. One should take note that although UMNO controls 50 % of all parliamentary seats, it controls 71 % of all the decision making processes within the cabinet. Many marginalization issues are the result of legislation passed by Barisan (UMNO). Component parties (MCA, MIC or Gerakan) cannot vote against what UMNO decides in whatever it likes, even if they wanted to. 4. If the opposition won all the seats it contested, no single opposition party can form the government. Why? Gerrymandering has ensured that even if Barisan were to win 50 % of the popular votes, it will still control 2/3 of parliament. Example: In 2004, Barisan took 64 % of the popular votes but ended up controlling 91 % of Parliament. Thus, it is easy to see why if they win only 50 % of the popular votes in the election, they will once again be able to dictate absolute power in the parliament. And Zam, the Minister of Information has the gall to protest to ALJazeera (Satellite TV) that Malaysia is democratic because it has elections. What cheek!!! Are these fair elections? Is this truly Malaysia Boleh...More like Malaysia Malu! Do your maths!! Do your part!! That's why every single vote against BN counts!! Deny BN 2/3 in Parliament. Income up 40%, you believe it? Do you believe it? Malaysians are better off than four years ago. With inflation flying sky high, the government can still claim that prices are all under control and inflation only increases 2%. When there was a 30sen per litre hike on fuel prices, the government told the people not to worry as the government will improve public transportation. DPM also asked people to change lifestyle. Today we still see people waiting for hours to get their buses coming. LRT/KTM Komuter still got problems - delay, malfunctioned, passengers trapped in the cabins/stations etc. PENANG: Malaysians from all walks of life are better off now than four years ago. Second Finance Minister Tan Sri Nor Mohamed Yakcop said the country’s per capita income had risen by 40% between 2004 and 2007, from RM15,819 (US$4,163) to RM22,345 (US$6,452). “If we compare in terms of US dollar, the per capita income has risen by 55% during the period due to the depreciation of the dollar against the ringgit. “The Barisan Nasional Government is confident that we will get the people’s mandate again, based on the improved economic resilience. “However, there will be challenges and we are prepared to meet them,” he told newsmen after visiting the St. Nicholas’ Home yesterday. Nor Mohamed, who presented RM25,000 to the home for them to buy an additional van, also said the average economic growth from 2004 to 2007 was 5.9%, compared to 5.1% from 2000 to 2003. “The 5.1% growth is already good but we have improve on it. We are confident of reaching 6% by the end of this year,” he said. He said the Government collected RM142bil in revenue in 2007, an increase of 53% compared to RM93bil in 2004. In terms of dividend payments, he said the Employees Provident Fund declared a 5.8% dividend last year compared to 4.5% in 2004. In comparison, Tabung Haji announced a 7% dividend last year compared to 4% in 2004. He said the Government’s focus on smallholders had resulted in them enjoying higher income. The average income of rubber and oil palm smallholders was RM3,041 and RM5,841 respectively last year, compared to RM1,226 and RM2,784 in 2004, he said. This was an increase of 148% and 109% in income for rubber and oil palm smallholders. Nor Mohamed said the market capitalisation of companies listed on Bursa Malaysia to date was RM1.05tril, an increase of 64% compared with RM640bil at the end of 2003. He said inflation rate from 2004 to 2007 was 2.5%, which was low, while the unemployment rate was 3.1% last year compared with 3.6% in 2004. The Star reported that Malaysia's per capita income rose by 40% in 2007 compared with 2004 according the Second Finance Minister, Tan Sri Nor Mohamed Yakcop in Penang. He said that per capita income was now RM22,345 compared with RM15,819 previously. Nor Mohamed Yakcop must either be completely out of his mind, or can no longer perform simple Mathematics or worse, attempting to insult the intelligence of ordinary Malaysians. Based on the above growth rates over the past 3 years, Malaysia's GDP grew by approximately 17.9% from 2004 to 2007. Income or GDP per capita is calculated by dividing the GDP with the total population. Therefore, it is completely inconceivable that our per capita income increased by 40% when our GDP grew by only 17.9%. Unless of course, the honourable Minister believes that our population shrunk by some 16%! To achieve 40% growth, Malaysia must be growing in excess of 12% per annum. Hence, to grow by 40% over 3 years, with a population growing at just under 2% per annum, that will actually make Malaysia the fastest growing economy in Asia, outstripping even China and India. The Second Finance Minister should refrain from getting intoxicated by the general election fever, in the attempts to paint a heavenly picture of the Malaysian economy. He must instead make an official public apology for his outrageous claims. Bagi sesiapa mengenali lebih rapat dengan Puan Chong Eng, Ahli Parlimen Bukit Mertajam, Pulau Pinang antara pemimpin wanita pembangkang suka bercakap bersandarkan kepada fakta. Chong Eng berkelulusan Ijazah Sarjana Muda Sains Pembangunan Manusia dari Universiti Pertanian Malaysia. Bekas guru dan pernah bertanding kerusi Dewan Undangan Negeri (DUN) Batu Lanchang pada pilihan raya umum 1995. Pada tahun 1999, Chong Eng bertanding di kerusi Parlimen Bukit Mertajam dan terus mempertahankan kerusi tersebut sehingga sekarang. Chong Eng adalah Ketua Wanita DAP Kebangsaan , Ketua Wanita DAP Pulau Pinang dan menjadi Timbalan Setiausaha Agung DAP. Seperkara yang jelas dalam diri Chong Eng boleh dikongsikan di ruangan ini pendirian jelasnya sentiasa membela kepentingan wanita di negara ini. Walau bagaimana pun untuk mengetahui selanjutnya pendirian dan suara hati Chong Eng ikuti temubual di ruangan ini. SOALAN (S) : Bagaimana dengan persepakatan DAP dengan parti pembangkang lainnya pada pilihan raya umum akan datang? CHONG ENG : Saya tak boleh komen perkara ini kecuali Setiausaha Agung DAP Kebangsaan (Lim Guan Eng). S : Apa antara isu bakal diketengahkan DAP pada pilihan raya umum akan datang? CHONG ENG : Saya rasa memang banyak isu dalam pilihan raya umum akan datang antaranya kenaikan harga barang, kenaikan harga minyak dan tol, tekanan kehidupan, kadar jenayah yang tinggi , ini merupakan satu isu yang sangat penting. Termasuklah isu ekonomi. Nampaknya suasana ini tidak begitu elok kepada rakyat biasa atau mereka yang bekerja untuk orang lain. S : Adakah rakyat marah dengan kenaikan harga barang umpamanya? CHONG ENG : Saya rasa perkara ini memberikan kesan kepada parti pemerintah. Setakat mana ianya memberi kesan saya tidak tahu. Tapi perkara ini akan memberikan kesan yang hebat kepada parti Barisan Nasional (BN) kerana rata-rata rakyat merungut pasal kenaikan harga barang umpamanya. S : Kami difahamkan rakyat tidak berpuashati dengan pentadbiran BN dan parti Gerakan dan UMNO di Pulau Pinang. Apa pendekatan dan strategi DAP untuk merampas Pulau Pinang dari BN? CHONG ENG : Kami seperti biasa akan membawa isu-isu rakyat di negeri ini. Kami mewakili rakyat Pulau Pinang untuk menyuarakan inspirasi mereka. Sekiranya UMNO dan BN membawa kesilapan jadi mereka bersedia menghadapi tindakan rakyat. Ini negara demokrasi. Bila-bila masa rakyat boleh berubah pendirian memilih parti boleh menyuarakan pandangan mereka. Dalam konteks P ulau Pinang sedikit sebanyak kelemahan pentadbiran BN umpamanya membuatkan rakyat memberikan sokongan kepada DAP. S : Orang Cina begitu bijak berpolitik dan tidak terlibat dalam demonstrasi jalanan umpamanya untuk menyuarakan pandangan mereka. Kita perhatikan orang Cina tidak begitu radikal dan agak berhemah dalam isu-isu melibatkan kepentingan kaum mereka. Kaum ini juga dilihat agak fokus dalam isu pendidikan dan ekonomi. Apa komen YB dalam soal ini? CHONG ENG : Saya rasa mungkin perkara ini ada kaitan dengan budaya dan filosopi kaum Cina. Saya rasa orang Cina berpendapat bukan sampai satu tahap yang mereka tidak boleh menyuarakan pandangan. Saya rasa kaum Cina mempunyai banyak saluran untuk menyuarakan pandangan selain daripada parti-parti politik. Mereka ada organisasi-organisasi sendiri seperti antaranya golongan peniaga mereka mempunyai persatuan peniaga untuk menyuarakan masalah ekonomi. Mereka juga ada Perhimpunan-perhimpunan Dewan Orang Cina di setiap negeri berserta gabungannya untuk menolong menyelesaikan masalah kaum Cina. Saya rasa belum sampai satu tahap seperti orang India. Mungkin mereka(orang India) sudah berputus asa dengan saluran-saluran ini. Dan mereka rasa tiada cara lain untuk menarik perhatian pihak lain mendengar suara atau rintihan hati mereka selain demonstrasi. S : Maksudnya YB berpendapat parti MIC dan PPP umpamanya gagal menyuarakan pandangan bangsa mereka? CHONG ENG : Saya rasa mereka gagal untuk membawa perubahan. Bangsa itu (kaum India) mungkin ada menyuarakan pandangan tetapi saluran itu tidak dapat membawakan penyelesaian kepada permasalahan-permasalahan yang ditimbulkan oleh komunitinya. Saya rasa saluran untuk menyuarakan pandangan mereka tidak berkesan. Jadi orang-orang berputus asa ini akan mencari saluran-saluran yang lain. S : Saya perhatikan dalam apa sahaja isu diketengahkan oleh DAP mempunyai fakta. Kenapa faktor ini wujud? CHONG ENG : Saya rasa ini adalah kerana kita sudah melalui perjuangan yang agak lama dan panjang. Kami telah mengumpul pengalaman dan lebih faham cara untuk mengutarakan masalah-masalah rakyat. Kita pun sudah membayar harga yang tinggi dan ramai pemimpin kami (DAP) sudah dikenakan tindakan ISA di Kemunting. Jadi kita lebih berhati-hati dan betul-betul concern dengan apa yang diperjuangkan. Kita lebih sensitif untuk membawa segala masalah tanpa memijak tempat-tempat yang dikatakan sensitif. Kami berusaha dan cuba ketengahkan segala isu pembelaan rakyat. S : Adakah YB berpuas hati dengan isu pembelaan wanita antaranya ibu tunggal, masalah sosial wanita dan sebagainya. Adakah YB berpuas hati dengan Kementerian Pembangunan Wanita,. Keluarga dan Masyarakat? CHONG ENG :Saya rasa ada banyak ruang untuk diperbaiki. Kita tidak mensasarkan tempat-tempat yang memerlukan bantuan. Ada pihak berpendapat perlu ada satu kaunselor dalam satu keluarga. Ini memang satu sasaran yang tidak realistik kerana pada waktu sekarang pun kita kekurangan kaunselor untuk mereka yang berada dalam krisis. Dalam krisis pun tak cukup kaunselor apatah lagi kita mahu mengadakan satu kaunselor untuk satu keluarga. Saya rasa ini tidak realistik dan ini selalunya slogan tidak membawa munafaat kepada realitinya. Jadi saya rasa yang terpenting kalau kita hendak mengupayakan wanita khasnya wanita dan ibu tunggal yang miskin kita mesti memberikan perkhidmatan penjagaan anak-anak mereka. Anak-anak mereka perlu dijaga barulah ibu bapa mereka boleh keluar bekerja. Kalau anak –anak tidak dijaga pada masa akan datang kita akan membelanjakan banyak wang untuk membina pusat-pusat pemulihan dan juga penjara. Saya rasa untuk memberi peluang yang sama kepada anak-anak dari keluarga yang miskin dan ibu tunggal kita mesti menyara anak-anak mereka. Ini adalah paling penting sekali sekiranya kita mahu mengupayakan wanita. Golongan wanitalah yang paling perlu diupayakan. S : Adakah peruntukan sebanyak antaranya RM400 atau RM500 untuk golongan wanita bermasalah boleh dianggap relevan sebagai saraan kehidupan mereka dewasa ini? CHONG ENG : Itu untuk sementara sahaja. Umpamanya kalau kita berikan ikan kepada seorang lebih baik kalau kita mengajarkan bagaimana cara menangkap ikan. Bantuan ini amat penting tetapi tidak cukup untuk mengupayakan ibu –ibu tunggal ini berdikari. Saya rasa semua bentuk bantuan dengan lain matlamat dan tujuan terakhirnya supaya mereka boleh berdikari. Dan mereka boleh depend on themselves keluarga mereka. Begitu juga ibu tunggal kita mesti membantu mereka supaya mereka boleh berdikari akhirnya. Anak-anak mereka juga harus mempunyai peluang yang sama di dalam pendidikan. S : Dulu kita melabelkan DAP terlalu sentimen perkauman dan memperjuangkan kepentingan orang Cina sahaja. Tapi kini kita perhatikan Hindraf terlalu sentimen perkauman sehingga sanggup menjadikan demonstrasi jalanan tiada permit untuk menyuarakan pandangan mereka? CHONG ENG : DAP sejak ditubuhkan memang untuk semua rakyat Malaysia. Parti UMNO, MIC dan MCA mereka memang merupakan parti perkauman. Mereka parti untuk satu kaum sahaja. Mereka juga mempermainkan isu-isu perkauman dan bukan DAP. Untuk Hindraf ini saya rasa negara kita ingin menjadi sebuah negara yang maju pada 2020. Untuk sebuah negara maju perlu mempunyai pasukan polis yang cekap serta boleh menangani isu demonstrasi jalanan. Semua negara maju membenarkan rakyatnya berdemonstrasi secara aman. Jadi tugas pasukan polis ialah supaya memastikan demonstrasi itu berjalan secara aman dan bukan membuat provokasi. Di negara maju lain tidak wujud provokasi polis dan sebagainya. Kita gunakan kuasa kita dan berpendirian oleh kerana perhimpunan ini tidak sah maka kita gunakan water canon dan segala kekasaran lainnya untuk menyuraikan keadaan. Kita kalau mahu menunjukkan satu negara yang bertamadun dan sudah maju kita mesti menunjukkan bahawa pasukan polis kita boleh menangani demonstrasi seperti ini secara aman. S : Tapi rata-rata merungut bila pemimpin UMNO atau BN khususnya minta permit perhimpunan selalu dipermudahkan berbeza parti pembangkang susah mahu mendapatkan permit walaupun perhimpunan itu dijalankan secara aman? Rakyat di negara ini ada yang mahu bersuara tapi tiada mempunyai platform. Itu sebab mereka memberontak bila tidak mendapat permit. Cuba rakyat atau pertubuhan mana-mana pun diberikan padang sama rata menggunakan segala peluang atau kemudahan yang ada di negara ini saya percaya masalah demontrasi jalanan tidak akan timbul? CHONG ENG : Ya…Ya…saya memang bersetuju dengan pandangan ini.Dia (kerajaan) mesti dilihat ada keadilan. Selalunya wujud dua standard. S : Dalam isu Hindraf misalnya kenapa pemimpin UMNO khususnya mahukan pemimpin pembangkang menyatakan pendirian masing-masing. Kenapa dalam isu-isu lain umpamanya melibatkan ekonomi, pendidikan pemimpin UMNO lebih berkecuali dan tidak mendapatkan respon pembangkang? Kenapa dalam isu pembelaan rakyat di negara ini kenapa tidak mengajak pemimpin DAP, PAS dan PKR menunjukkan pendirian atau pandangan mereka? CHONG ENG : Ya…Itu memang selalu kita cakap. Apabila ada masalah mereka akan kata ini tanggungjawab kita bersama. Tapi apabila untuk mengagihkan sumber kek ekonomi mereka kata mempunyai kuasa pula. Seolah ada dua standard. Saya rasa ini menunjukkan bahawa parti pemerintah belum matang lagi dari perspektif demokrasi. Demokrasi ialah mesti menghormati pandangan semua pihak walaupun merupakan pandangan minoriti. Itu hak demokrasi. S : Adakah benar dakwaan Hindraf bahawa kerajaan ingin menghapuskan etnik kaum di negara ini? CHONG ENG : Itu pun saya tidak setujulah bukan sampai tahap itu. Tetapi secara realiti memang mereka telah dipinggirkan dalam proses pembangunan. Kalau kita lihat keciciran paling tinggi termasuk pembangunan di bidang ekonomi di negara ini adalah kaum India. Dulu mereka ada 3 peratus ekuiti sekarang hanya 1.5 peratus. Cuba kita tengok mereka ditahan di penjara di Simpang Renggam 40 peratus terdiri kaum India. Padahal dalam populasi kaum mereka cuma merupakan 8 peratus saja. Jadi kita lihat ada yang tidak betul. Dulu kakitangan kerajaan di kalangan kaum India ada 10 peratus sekarang cuma 5 peratus. Jadi mereka memang dalam proses dipinggirkan. Dulu mereka ada tempat di estet-estet tetapi sekarang banyak estet sudah menjadi kawasan pembangunan. Jadi mereka mahu pergi ke mana? Jadi bila mereka datang ke bandar memang mereka menjadi golongan yang miskin. S : Kenapa jadi begitu? Apa usaha MIC pula untuk menangani masalah bangsa mereka? CHONG ENG : Itulah saya katakan tadi MIC bukan merupakan satu parti dan satu saluran yang berkesan. Ini adalah kerana UMNO terlalu kuat di dalam BN. Apa yang dikatakan oleh UMNO menjadi polisi dan menjadi dasar dalam parti komponen. Apa yang mereka kata pun UMNO tidak peduli. Begitu juga kata MCA . Saya rasa UMNO mesti bertindak lebih adil kepada parti-parti komponen BN. S : Jadi YB bimbang dengan perpaduan kaum di kalangan rakyat berbagai bangsa di negara ini? Yalah kalau dulu kita boleh tengok ketiga-tiga bangsa ini hidup berpakat dan bekerjasama dengan baik tapi sekarang seolah-olah ada gap di antara mereka? Orang Melayu dengan kehidupannya. Orang Cina asyik memfokuskan kepada ekonomi begitu juga orang India dalam dunia mereka masing-masing. Sebagai generasi muda saya merasakan kebimbangan teramat sangat andai isu perpaduan kaum ini tidak ditangani dengan baik? CHONG ENG : Saya rasa dulu pun wujud suasana ini. Sekarang ada golongan tidak toleransi. Ada pihak tidak toleransi kerana awak tidak sama dengan saya maka saya tidak bersetuju dengan awak. Saya rasa itu lebih ketara pada waktu sekarang . Dulu semua boleh duduk, makan dan tidur bersama walaupun makan makanan berbeza. Tapi boleh makan bersama. Sekarang kita lihat Islam sudah terlalu ditekankan dalam serbi sehingga menjadi satu halangan. Nak makan pun susah. Saya rasa kita mesti lebih menekankan kepada multi racial.Negara ini memang sebuah negara majmuk perlukan semua bangsa di dalamnya. Kalau kita selalu kata ini sebuah negara Islam saya rasa bukan satu gejala yang sihat. S : Bagaimana YB melihat pendekatan Islam Hadhari? Bagaimana orang Cina melihat Islam Hadhari? CHONG ENG : Sama ada dia Islam atau Islam Hadhari apa yang orang Cina mahukan ialah Islam yang adil kepada semua. Apa nama itu tak penting tapi isinya atau apa yang awak buat itu lebih penting. S : Bagaimana sokongan rakyat kepada DAP berekoran isu kenaikan harga barangan dan isu-isu diketengahkan oleh DAP di Dewan Rakyat misalnya. Apakah sokongan orang Cina kepada DAP semakin bertambah? CHONG ENG : Saya rasa setelah tiga kali pilihan raya di mana rakyat sudah memberi mandat yang besar kepada BN tetapi mereka tidak lihat bahawa mereka menikmati kehidupan lebih baik, menikmati pentadbiran yang lebih baik. Jadi saya rasa mereka sekarang sedar bahawa di mana-mana negara pun perlukan pembangkang yang lebih kuat. Jadi mereka kena bersedia mengupayakan pembangkang termasuk DAP merupakan pembangkang yang sangat ulung dan memang menunjukkkan principlenya. S : Bagaimana dengan Pulau Pinang. Adakah DAP confident mampu merampas negeri itu dari BN dalam pilihan raya umum akan datang? CHONG ENG : Saya rasa itu bukan perkara yang senang.memandangkan kami hanya ada satu kerusi. Kita semua tahu bahawa pilihan raya umum bukan bersih sangat dan bukan bebas. Kita masih menghadapi jentera yang begitu kuat, seluruh kerajaan dan juga media boleh dikawal. Bukan saya kata orang media ini tidak adil memang mereka ditekan khasnya radio dan televisyen. Saya rasa di bawah keadaan seperti ini susah untuk mana-mana pembangkang pun untuk menjatuhkan kerajaan seperti ini. S : Tapi pengundi kena bijaklah. Kalau nampak sesuatu tidak betul dalam pentadbiran kerajaan kena tukarlah seperti rakyat di Amerika Syarikat sering bertukar kerajaan setiap pilihan raya lima tahun sekali? Jadi di Malaysia ini rakyat melihat seolah-olah tiada parti lain boleh memperjuangkan suara mereka selain BN. Jadi rakyat kena bijak menilai dan bertanggungjawab memilih kerajaan boleh memperjuangkan suara mereka bukan untuk perjuangan individu tertentu.Apa komen YB dalam soal ini? CHONG ENG : Apa yang you kata ada kebenarannya tetapi keadaan di Amerika tidak sama dengan keadaan negara kita. Di Amerika ada kebebasan media.. Kebebasan media sangat penting. Kalau media dibebaskan jadi orang boleh cakap apa yang mereka mahu cakapkan dan juga media boleh menulis atau melapor. Jadi orang akan mendapat semua maklumat dan pandangan. Mereka boleh membuat keputusan yang bijak. Sekarang rakyat hanya mendapat pandangan satu pihak sahaja iaitu kerajaan. Rakyat juga tidak mendapat maklumat dari parti pembangkang jadi kita tidak boleh salahkan rakyat. Kita kena salahkan kerajaan sebab kerajaan ingin membodohkan rakyat. Ini tidak bagus walaupun dia akan menang dalam pilihan raya tapi sekiranya sebahagian besar rakyat menjadi bodoh tidak boleh berfikir perkara ini akan menjejaskan ekonomi negara.. Pada pendapat saya parti pemerintah akan untung untuk satu jangkamasa yang pendek dan ia akan merugikan rakyat dan seluruh negara untuk jangka yang panjang. S : Perasaan tidak puas hati rakyat boleh kita tengok melalui Perhimpunan Bersih dan terbaru Hindraf? YB pun tahu perasaan rakyat umpama air di empangan akan pecah kalau suara mereka tidak didengari oleh kerajaan? Ini bermakna kalau kebebasan bersuara disekat akan berlaku banyak lagi demonstrasi jalanan? CHONG ENG : Saya tanya sendiri dengan penyokong Hindraf terlibat dengan demonstrasi jalanan baru-baru ini adakah mereka tidak takut ditangkap atau dipenjarakan. Jawab mereka biar generasi saya menderita tapi saya mahu anak saya menikmati kehidupan yang lebih baik. Saya berpendapat ini sudah mencapai satu tahap kalau anak kita tidak takut dirotan jadi rotan tidak akan berkesan. Kalau rakyat sudah bersedia untuk pergi ke penjara untuk menyuarakan pandangan mereka jadi tidak ada lagi apa-apa undang-undang atau hukuman boleh menghentikan tindakan mereka. S : Bagaimana YB melihat pentadbiran Pak Lah? Adakah Pak Lah adil atau ultra Melayu? CHONG ENG : Beliau perlu bertindak untuk menunjukkan bahawa beliau serius dengan apa yang beliau cakap. Beliau mesti cakap serupa bikin kerana orang Cina kata, saya dengar apa yang awak kata. Nanti saya akan tengok apakah awak bertindak seperti apa yang awak cakap. S : Bagaimana dengan isu rasuah adakah Pak Lah mengotakan apa yang beliau janjikan semasa mula-mula menyandang jawatan Perdana Menteri? CHONG ENG : Saya berpendapat isu rasuah atau isu beliau (Pak Lah) mahu mendengar kebenaran semua itu belum cukup lagi. Belum cukup membuktikan bahawa beliau adalah serius dan cakap serupa bikin. S : Bagaimana dengan kerusi wanita DAP pada pilihan raya umum akan datang? CHONG ENG : DAP merupakan satu-satu parti pada waktu sekarang telah menerima pakai 3 peratus calon pilihan raya umum akan datang adalah wanita. Masalah kami ialah wanita tidak mahu expose ke depan untuk menyahut cabaran sebagai wakil rakyat. Saya rasa adalah perlu untuk menggalak lebih ramai wanita untuk bertanding kerana kita perlukan pandangan yang berlainan termasuk dari perspektif wanita. Tapi kita tidak mahu wanita apabila dipilih mereka bertindak seperti kaum lelaki sahaja tidak membawa isu-isu wanita, tidak menyuarakan kepentingan wanita kita tidak perlu wanita jenis ini. Kita mesti memerlukan pemimpin wanita yang menbawa kepentingan dan isu-isu wanita. S : Bagaimana YB melihat UMNO yang memperjuangkan DEB atau memperjuangkan kaum mereka. Isu cium keris dan benda-benda yang boleh dianggap sensitif kepada kaum mereka. Pada saya semua orang di Malaysia ini harus menikmati kemudahan yang sama rasa, sama adil dalam semua aspek kehidupan serta tidak tertumpu kepada kaum-kaum tertentu sahaja? CHONG ENG : Ya, DEB pada asalnya ialah untuk menghapuskan kemiskinan dan kemiskinan pada hari ini pun sudah banyak dihapuskan. Saya rasa banyak dasar-dasar di bawah ini ialah bukan untuk menghapuskan kemiskinan tetapi untuk membantu orang jadi kaya. Geran-geran yang diberi untuk orang berniaga itu untuk membantu orang jadi kaya. Apabila kita masih ada orang miskin kita tidak boleh menyarungkan sumber yang banyak untuk menjadikan orang menjadi kaya. Kalau kita hendak orang menjadi kaya kita mesti memberikan pinjaman saja. Tidak boleh bagi loan. Kita kena mewujudkan peluang, memberikan latihan kemahiran itu yang saya boleh terima. Katakan memberi geran dan tidak boleh membayar pinjaman balik itu saya rasa ini tidak akan membantu untuk meningkatkan pendapatan mereka. Sekiranya diberikan konsesi pun dia mesti ada time limitnya. Saya bagi awak peluang ini untuk berniaga tapi awak mesti berjaya pada lima tahun akan datang.Sekiranya awak tidak berjaya, awak tidak boleh berdiri di atas kaki sendiri, tidak boleh bersaing dan sorrylah awak tidak berjaya dan peluang awak sudah habis. Kali ini giliran orang lain pula. Tak boleh bagi orang yang sama secara berulang-ulang. Ini membuatkan orang ini terlalu bergantung kepada kerajaan. Yalah, dia tak payah bersaing atau bekerja kuat.Semua kerajaan bantu. S : Adakah YB rasa orang Melayu tidak perlu diberikan tongkat dan tidak perlu diberi subsidi lagi. Mereka kena bersaing seperti mana bangsa-bangsa lain di negara ini? CHONG ENG : Saya rasa untuk kepentingan jangkamasa negara mereka mesti perlu bersaing. Kita tidak boleh membiarkan Melayu merupakan penduduk majoriti mendapat subsidi dari kerajaan. Kalau mereka tidak boleh bersaing jadi seluruh negara tidak boleh bersaing. UMNO terlalu manjakan orang Melayu. Asyik ‘beri ikan’ sahaja. Bagi…Bagi…Bagi. Selalu nak jadi seperti santa klaus . Apa yang diminta semua diberi. Minta dapat. Easy come easy go. Saya lihat peniaga kecil bumiputera kalau kerajaan tarik balik semua konsesi umpamanya kalau dia mesti menyewa tempat itu mengikut pasaran dia tidak boleh berniaga lagi. Itu akan menjadi masalah. This is the two-storey bungalow alleged to have been offered by Datuk V.K. Lingam to the then Chief Justice Tun Eusoff Chin in 1995. The bungalow is located along Jalan SS1/38, Kampung Tunku, Petaling Jaya. The Royal Commission of Inquiry into the Lingam Tape Scandal was told by V.K. Lingam's brother, V Thirunama Karasu. The Royal Commission was also informed that Lingam did not like the house and he wanted a bigger house. He said that Eusoff Chin and his wife were unhappy with the house as it was located at a dangerous corner and they were afraid that their sons could meet with accident once stepping out of the bungalow. I called a press conference last Sunday. A couple of gas cylinder delivery workers were detained by the police when the police did not believe in their earlier reports when they reported that three youths tried to cart awat several cylinders in Shah Alam. PETALING JAYA: All they did was try to fend off thieves, but they ended up being detained in a police lock-up for three days. Gas cylinder delivery workers Heng Chee Yong, 20, and Azizi Mahmud, 30, were on their rounds on Tuesday morning when they saw three youths trying to cart away several cylinders when they made a stop at the Section 28 food court in Shah Alam. Heng chased away the would-be thieves with a PVC pipe and the two later lodged a report at the Section 11 police station in Shah Alam. That evening, they received a call from a policeman asking them to return to the station. They returned the following day and were arrested because the youths had lodged a report saying Heng had chased them with a parang. 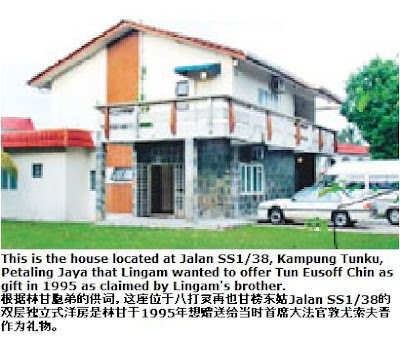 On Friday, Heng's elder brother and his employer went to the station where they spoke to the investigating officer. Heng claimed the officer asked his brother for an "ang pow", while another policeman asked for his pre-paid handphone to be topped up. The brother and employer called state DAP legal bureau chief Lim Lip Eng, who went to see the acting district police chief, Superintendent Mohd Shariff Abdul Wahid. Heng and Azizi were then released. Shariff said an internal investigation had begun. PJ DAP today visited various morning wet market in PJ to wish PJ folks a Happy Chinese New year and to distribute Ang Pow packets to PJ folks to wish them a prosperous New Year. This is the first time we distribute Ang Pow packets to PJ folks instead of sending greeting cards which was the conventional way to sending our wishes to the people. We have visited Sungai Way market, SEA Park market and several morning walk spots in PJ and distributed a total of 10,000 Ang Pow packets. Also attending are Dr Cheah Wing Yin, Tony Pua and Selangor DAP Assistant Secretary Tiew Way Keng. Barisan Nasional on 31st January 2008 announce to build six new SJKCs and relocate another 13 SJKCs. According to press reports, the six new SJKCs will be built in Sungai Long, Kajang, Bukit Serdang and Rawang in Selangor, Wangsa Maju in Kuala Lumpur and Danga Bay in Johore Bharu. Out of 13 relocated SJKCs, there are three from Selangor, three from Johore, three from Malacca, one each from Kuala Lumpur, Negri Sembilan, Pahang and Kedah. What is disappointing is that the government has no intention to reopen SJKC Damansara in Petaling Jaya which was closed more than eight years ago. Besides, out of the six new SJKCs, none of them are to be built in Petaling Jaya or Cheras which most residents are Chinese. Although we welcome such goodies, promises are still promises before they become realities. According to statistics from Dong Jiao Zong, the government had promised to build ten new SJKC from 1999 election to 2004 election. To date, there is still one outstanding school to be built in Kuantan. Simultaneously, the government had approved to relocate 62 SJKCs, of which 21 SJKCs are still outstanding. This proves that you have no reason to be happy when the government announced any number until you see the schools are built. If MCA is so capable, then they should first re-open SJKC Damansara. 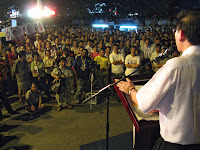 In fact, before the previous General Election in 2004, MCA had asked villagers to vote MCA candidates in Petaling Jaya Utara first before the school could be re-opened. This had resulted DAP candidates to lost 288 and 380 votes in PJ Utara Parliament and Damansara Utama State seats contested in PJU. 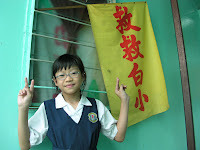 The huge support given to BN did not translate into the re-opening of SJKC Damansara. Will MCA deploy the same tricks to cheat voters this time? Why can’t MCA just push the ministry to re-open the school before they pledge to build or relocate more SJKCs? Why can’t they do it without setting any pre-conditions like the school can only be re-opened in 2009 or after general election? Let prove your sincerity by re-opening the school first. DAP CEC leader Ronnie Liu today was in Pandamaran to wish Happy Chinese New Year to Klang folks. Ronnie has been a good Chinese caligrapher, probably the only Chinese caligrapher in the whole line up of DAP CEC. He told the press that he is yet to be confirmed contesting in Pandamaran, subjecting to the final decision of the Secretary-General. I hope the line up can be finalised as soon as possible in Selangor as we need to move on in one team against the might of BN. I have today submitted a petition to Selangor Mentri Besar Dato' Seri Khir Toyo on the recent order from Lembaga Urus Air Selangor (LUAS) to all factory and golf clubs owners to apply permit from LUAS and to pay nominal charges when collecting ground water, including rain water. I have raised in my petition that such action is inappropriate and I personally wish that MB himself can settle the issue before Chinese New Year. 1. Why does LUAS only implement the enactment (which was enacted in 1999) by Selangor DUN 8 eight years after its enactment? Why weren't there any consultations with business and factory owners then? 2. Rain waters come from sky. Ground waters are taken from the ground. Selangor State Government does not provide any services or treatment. What basis does the State Government has to collect charges from the people? 3. Such thing is the good works of certain "Little Napoleans" in the government. Rain waters are gift from God. Can the state government act on behalf of God to collect charges? If that's the case, then are we going to pay for the air we breathe and the sunshine we enjoy in future? You see, this is why you need opposition in the DUN as well. Else, you won't know what funny charges will come for you in future.